 Canada / UK / France  1999  97m   Directed by: David Cronenberg.  Starring: Jennifer Jason Leigh, Jude Law, Ian Holm, Willem Dafoe, Don McKellar, Callum Keith Rennie, Christopher Eccleston, Sarah Polley, Robert A. Silverman, Oscar Hsu, Kris Lemche, Vik Sahay, Kirsten Johnson.  Music by: Howard Shore. In retrospect, "Existenz" is part of a group of films released between 1998 and 2001, all of which examine the fragile lines separating an illusory reality from a supposedly more authentic Real. These films, which include "The Matrix", "Vanilla Sky", "Eyes Wide Shut", "Dark City", "Existenz", "Mulholland Drive", "The Truman Show", "Fight Club" and "A History of Violence", all portray reality as a hyper-real simulation in possession of a dark and violent underside. 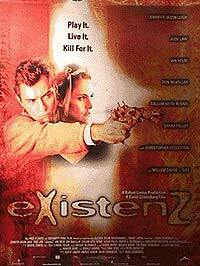 But what separates "Existenz" from its big budget counterparts are it's biomechanical themes. Marshall McLuhan famously asserted that all technological advancements are merely extensions of the human body; clothing an extension of our skin, binoculars of our eyes, cars of our legs, media of our minds and desires. McLuhan believed that as media builds upon itself, it grows further and further away from our human skin until the limits of our bodies becomes less and less definable. This bodily alienation is highlighted in "Existenz". The film establishes a series of layered hyper-realities for the players of a virtual reality game to connect to. In order to enter each new layer of the game, the players must literally "plug in" using organic looking spinal grafts. These grafts let the players enter the computer generated landscape of the game whilst leaving their physical bodies behind. They are, essentially, wilfully disembodied from their physical reality. But though McLuhan suggests a "re-fragmentation" of the Self through extensions into media realities, other thinkers suggest less pessimistic models. For example, though our instruments have become detachable organs, they need not displace us entirely. Isn't it possible that our senses, no longer limited to our physical bodies, now become receptors to a wider variety of stimuli and perceptions? Cronenberg acknowledges this, but highlights the complications in returning to our real bodies. Recalibration to a pure reality is becoming increasingly impossible. One can imagine future generations thinking of their own brains as "organic computers" and not computers as "imitations of the brain". In other words, the machine becomes something that our body aspires to or increasingly enjoys being with. On yet another level, "Existenz" portrays a war between a group of "game players" and rebels known as "The Realists". The Realists want all game designers and games destroyed. They want the simulation to end, and all of humanity to re-enter reality. The great joke (which only Cronenberg and Kubrick seem to acknowledge) is that these Realists who delight in such demystification are operating under the most lamentable and unsupportable of assumptions: the idea that you can strip away all fantasy. The "reality" they defend is, in fact, the ontology of a depressive, shabbily empirical, nothing ever adding up to more than the sum of its parts, nothing worth getting worked up about, nothing connecting with nothing, existence. IE- post modern hyper-real hell. They're defending simply another fantasy level in a game, unable to face the fact that The Real is itself a cosmic ateleological event, completely without design. The Real is purposiveness without purpose. Think the giant conversation at the end of "Eyes Wide Shut", Tom Cruise standing over a pool board as "everything is explained" but "nothing actually adds up". Cronenberg is thus a kind of ontological existentialist, believing that the very nature of reality itself, the individual choices of subjects, is radically open. Watch how he has his lead character (played by Jude Law), confront the existential horror of abandonment and despair when he complains to the game designer (who is herself a mere player and not the actual game designer) that the game is without final purpose and that they are forever being assaulted by malevolent forces intent upon destroying them. It's a game that would be hard to market, he moans. And yet, as she smartly replies, it's a game that everyone is already playing. The Realists, however, want to defend their comfortable self-delusions. They want to believe that the particular world in which they find themselves, a mere consensual hallucination, is fixed and determined. What guarantees such pre-determination is of course the functioning of a transcended game designer whose role is basically a metaphor for God. Finally, "Existenz" makes a distinction between players who are capable of making choices and preprogrammed drones who are nevertheless also players. Unable to act unless triggered by specific lines of dialogue, these drones are reminiscent of so many interactions with "real" human beings in late Capitalism: robot announcers, telemarketers, call centre employees etc. These days, professionalization means becoming as much like a bureaucratically controlled drone as is humanly possible, man losing all signs of autonomy, unable to sensitively engage with situations or people around him. 8.910 -' This film has aged well. Briskly told, "Existenz" has an elegance and sexiness which lifts it above its big budget, more action oriented, brothers. Review by tieman64 from the Internet Movie Database.